Remodeling your kitchen is a great investment for any homeowner. In addition to creating a beautiful, functional place to cook delicious meals, entertain guests, and spend family time, a kitchen remodel offers a high return rate in the real estate market. Such a large project does require careful planning to ensure its affordability, since certain factors like the amount of labor, the kitchen's size and the chosen materials can greatly affect the overall cost. To help you stay on budget, The Home Depot has compiled a comprehensive cost guide. 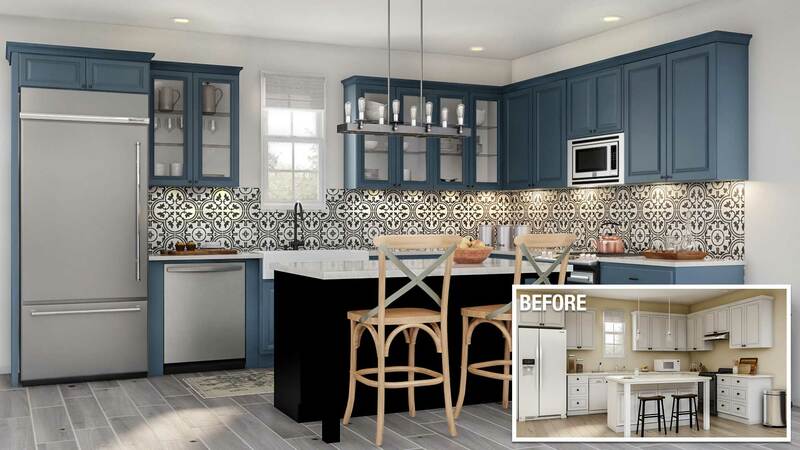 This guide compares three possible remodels for a 200-square-foot kitchen, categorized as minor, major and upscale in scope. Sourced from Hanley Wood Market Intelligence, the following estimates are national averages and will vary by location. Minor remodels aim to preserve the kitchen’s existing footprint while refreshing its overall appearance and usability. 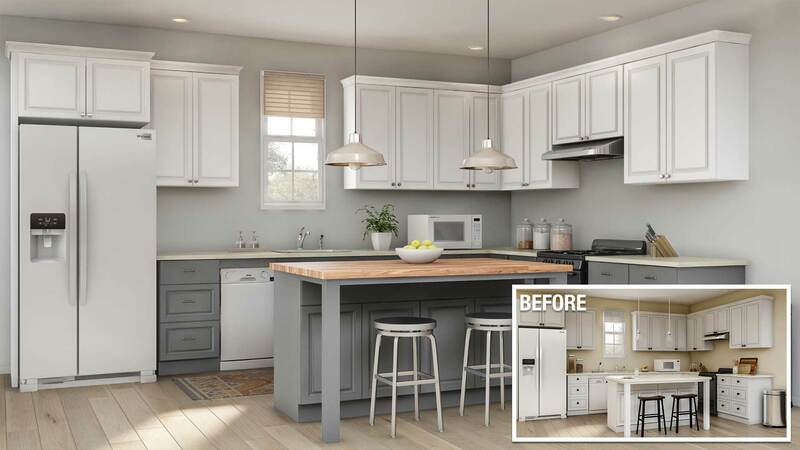 The significant changes are usually budget-friendly fixes like painting the walls, adding new flooring and buying energy-efficient appliances, since the customer isn’t selecting top-of-the-line materials or products. Cabinetry is often a lofty expense, but minor remodels opt for money-saving measures like refacing the existing cabinets or selecting entry-level cabinets, which are mass-produced and ready-to-install. Major remodels involve a larger overhaul of the existing kitchen than minor remodels. Key fixtures—lighting, appliances and flooring—are replaced with new versions, while extra touches are added such as a high-end sink with matching faucet and semi-custom cabinetry. Semi-custom cabinets are customizable, with versatile sizing and door front options. Upscale kitchen remodels usually include specialty or luxury additions. These items—like high-end countertops, top-of-the line appliances and built-in water filtration systems—help a kitchen go above and beyond both in usability and appearance. The kitchen’s existing footprint may also be altered in upscale remodels. The average cost of kitchen fixtures, appliances, and labor differs by U.S. region. Remodeling projects in the Southern United States are generally cheaper than identical projects completed in Northern and Western areas. For instance, a major kitchen overhaul with midrange materials could cost $56,639 in Titusville, FL and rise to $77,460 if completed in San Francisco, CA. These differing figures are partially due to lowered labor costs in the south, but the average income level of the region’s inhabitants also plays a role. When budgeting for your kitchen remodel, we suggest comparing prices with your local Home Depot to accurately estimate the total cost. Prior to getting started, it's necessary to determine the primary goals of your kitchen remodeling. We recommend answering the following questions in order to successfully plan your project. Is my kitchen's main purpose to entertain guests, cook gourmet meals or be family-friendly? Do I like the layout of my current kitchen? Can I simply update the finishes? What are the top things I would like my kitchen's design to accomplish? One-third of the cost goes toward new cabinetry or refurbishing the existing cabinets. 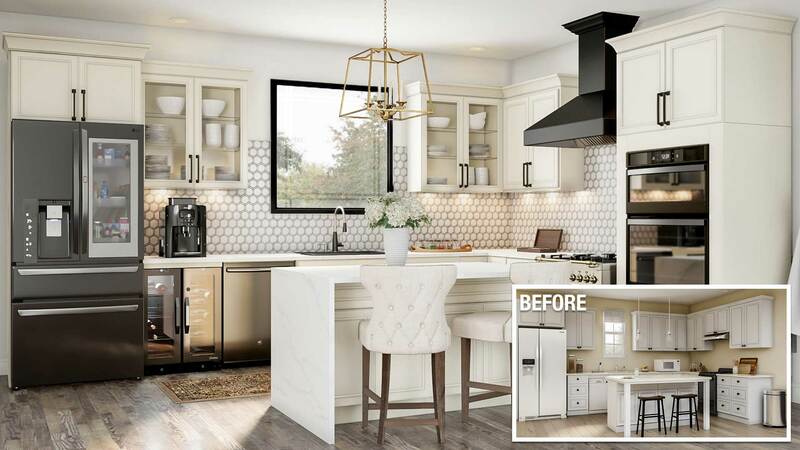 Another third will go toward finishing touches like updated countertops, sinks and faucets, backsplashes, flooring and energy-efficient appliances. Your installation and labor expenses are the final third of your total remodeling cost. Tip: If your kitchen remodel project requires new plumbing or electrical re-wiring, it will also factor into the total cost. This kind of labor is not typically included in the initial quote. Your contractor should be able to provide pricing specifics as needed. In general, cabinetry equates to a third of your remodeling budget. Custom cabinets or semi-custom cabinets are the best choices for improving your home's value since they are designed to fit perfectly into your kitchen and make a great first impression. Refacing your existing cabinets is an economical option that will improve your kitchen's overall appearance. Be aware that if you expand the current footprint of your cabinetry’s layout, the cost will rise. Keeping your existing kitchen appliances can save you money in the short-term. If your stove, oven, dishwasher or fridge isn't Energy Star-certified, however, you should consider upgrading them. Energy-efficient appliances pay for themselves over time by lowering your utility bills, and they help to preserve the environment, too. Additional electrical rewiring may be required to accommodate Energy Star appliances. The price of new countertops differs widely based on materials. Stone surfaces, like quartz and granite, are the most durable, but also the most expensive. Solid surface and laminate are less costly but require more maintenance. Ceramic tiles are generally an affordable backsplash alternative, depending on their brand and the complexity of the tiling layout. A kitchen under construction is a prime candidate for electrical rewiring. So, if you want to install undercabinet lights, add outlets and fixtures or change your floorplan, your remodel is an excellent occasion to call up an electrician. Safety: Don't attempt electrical projects without the help of a trained professional. The cost of flooring depends on whether you're replacing a few cracked tiles or doing a complete overhaul of your existing flooring. If you're opting for the latter, the price will depend on your kitchen's square footage and the flooring material you've chosen. Vinyl is generally the most affordable option. While ceramic tile, laminate, cork and hardwood tend to cost more, they can also increase your home's value. Maintaining your existing plumbing is an excellent way to reduce costs. You can still invest in new appliances, sinks and faucets as long as you install them in the current plumbing positions. If your remodeling design requires the installation of new pipes or you're changing your kitchen's floor plan, be prepared to pay a plumber for labor and the necessary plumbing parts. Applying a fresh coat of paint to your kitchen's walls and baseboards is an easy way to spruce up the room at minimal cost. A few cans of paint and brushes make a long-lasting impact on your walls at low cost. If your cabinetry or countertops require a full removal or demolition of their existing structure, your labor costs could be higher. After all, these remodeling processes are more time-consuming and labor-intensive for your installers to perform. The Home Depot is a great place to buy your kitchen appliances and remodeling materials. We also provide top-rated design and installation services for homeowners across America. Besides undergoing full background checks, our hand-selected remodeling experts are local, licensed and insured. The Home Depot also offers a great selection of flexible finance options.